The “muse pallet” receives many search engine inquiries about youngest daughter, Chef Dakota Weiss. I’ve listed under this Page all the different stories about our family’s super-star chef. When Dakota was born, an astrologer said, “She’ll be famous for her hats.” Well, that sounded goofy. The days of Heda Hopper were over. But in 1976, we didn’t think of women wearing toques. Right out of Scottsdale Culinary School, celeb Chef Mark Miller put Dakota in his Coyote Cafe kitchen, where she eventually became his first female sous chef. 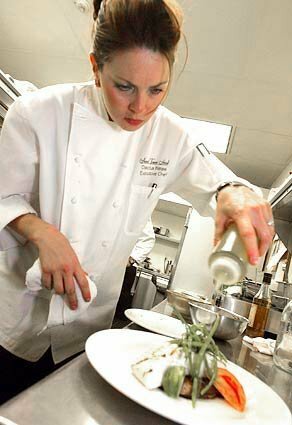 She then went on to work under Chef Dean Fearing, and then later under the tutorial wing of Chef Bruno Menard at the Atlanta Ritz-Carlton.